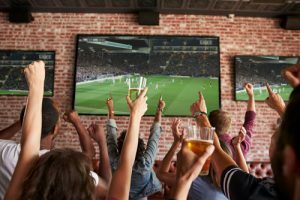 NBC Sports Grill & Brew – Looking for a way to take in sports coverage from every conceivable avenue? The NBC Sports Grill & Brew is the place for you. Nearly 100 TVs showcase a variety of current sports as you drink and enjoy classic dishes like burgers, barbecue, and original salad creations. Topgolf Orlando – More than a sports bar, Topgolf Orlando not only has TVs throughout their restaurant and bar areas, but all of their driving-range bays are equipped with TVs so you can practice your swing while you catch up on your favorite sports. Splitsville Luxury Lanes – With a reputation as one of the best bowling alleys in Orlando, Splitsville is a must on every sports lover’s to-do list. Over 70 TVs, four bars, 30 bowling lanes, and a fresh take on conventional bowling alley food make Splitsville one of the best places to watch and play sports. Dewey’s Indoor Sports Bar & Grille – Over 100 TVs, a massive theater-sized screen, upscale food service, a full bar, and constant score-monitoring ribbons in the bar area make Dewey’s one of the best spots in Orlando for sports lovers. This Orlando original is located just a few minutes from Universal Orlando Resort and SeaWorld Orlando. Main Event Orlando – Conveniently situated on International Drive, Main Event immerses visitors in the sports action, while offering interesting twists on classic American dishes and cocktails. If you need a break from watching the action, you can try out their signature bowling options, rope-adventure course, billiards, and even a state-of-the-art virtual reality game. Whether you love sports, or just love great food and atmosphere, the options in Orlando are nearly limitless. When you’re planning a trip to The City Beautiful, choose a lodging option that is not only comfortable, but keeps you close to all that Orlando has to offer. To book your stay with us here at the Rosen Inn, contact us today at 407-996-4444.